At last, the tables were turned. Remembering the many times reporters for this newspaper interviewed me about a book or story I’ve written, I was grateful that it was now my chance to interview one of them. 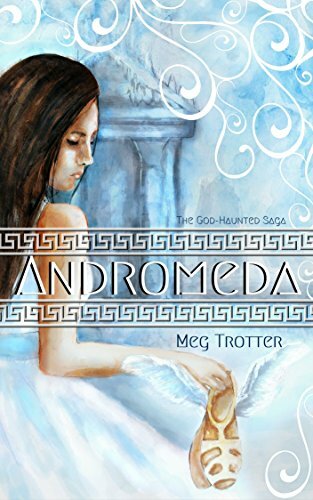 Through the grapevine, I’d learned that Megan Trotter, a news and features reporter who also edits the Herald-Citizen Living section, was about to publish a Young Adult novel entitled “Andromeda.” I called to ask if she had an advance copy that I could read to review in this column. She handed one over. I read it in practically one sitting and loved it. Set in Ancient Greece, it’s the story of 17-year-old Princess Andromeda, whose entire life—including an arranged marriage to a hateful older man—has been dictated by her parents and by the expectations of society. Now widowed, she’s being forced into yet another loveless political marriage for the sake of her country’s stability. But Amphitrite, the goddess of the sea, has other ideas. Jealous of the princess, she demands that Andromeda be sacrificed to a sea beast lest her country be destroyed. Can Andromeda find the strength and cunning to do what she’s never done before—fight for her own life? I’ll never tell. Any book reviewer worth her salt knows not to spoil the ending for potential readers. But I will say that Megan tells a rollicking good tale of the young princess’s many adventures as she valiantly tries to save her kingdom and herself. She visits the Oracle at Delphi. Travels to the Parthenon in Athens. Braves the underworld and the island where snake-haired Medusa lives. I’ll also confess that the novel’s ending took me totally, completely and utterly by surprise. When it comes to Ancient Greek history and mythology, Megan clearly knows her stuff. How, I asked, did she become interested in such things? Once she finished her manuscript, Megan sought out traditional literary agents and publishers who might be interested in her book. But after months of jumping through hoops and getting no offers, she decided to publish “Andromeda” herself through amazon.com. Which meant that she not only had to produce a finely polished story, but lay out the manuscript, create chapter titles and design the cover. All of which she did, with the help of her sister Emily Venturino, who created the heroine’s portrait on the front cover. Megan’s discipline has paid off and her talent shines through. “Andromeda” is available as both an e-book and a trade paperback on amazon. Don’t miss it.